Below we take a look at the Movistar team. During the last few years, Movistar have been one of the less active teams on the transfer market. With several overall wins in the WorldTour, both in the individual and team standings, the team have found a formula that works and apparently manager Eusebio Unzue is keen not to make too many changes. The team have two clear leaders, Nairo Quintana and Alejandro Valverde, and their consistency means that the team has a guarantee for success. Hence, the main goal of the off-season was to extend the contract with both captains. Furthermore, they have been very good at developing the best Spanish talents into winners and it is testament to their success that many riders on the roster have contributed to the success. The two main riders may have scored the majority of the WorldTour points but many riders have showed themselves at some point during the season. For 2017, the team have clearly followed the same path and this time there has been no star signing at all. Unlike last year when the team brought in Daniel Moreno, the transfer campaign has been very low-key, with the signings mostly being solid support riders or young talents. Unfortunately, Unzue has also lost one of his three most successful riders and with no replacement brought in, it is hard not to describe the 2017 team as being slightly weaker than the successful 2016 squad. The main reason for this is the loss of Ion Izagirre. The Basque has slowly developed into one of the best one-week stage races in the world and with a fifth place at Paris-Nice, podium places at the Tour de Romandie and the Tour de Suisse and a top 10 at the Eneco Tour added to a memorable stage win in the Tour de France, he played a key role in securing the overall win in the teams classification. Izagirre even had a contract for 2017 but in their desperate search for WorldTour points, Bahrain-Merida were willing to pay Movistar for breaking the deal. It is a bit of a surprise that Unzue allowed this to happen. Izagirre may not have turned professional in their team but he has taken his major steps during his time with the team. Without his haul of WorldTour points, it looks increasingly unlikely that Movistar will defend their title at the top of the WorldTour standings which has always been a very proud achievement for the team. At the same time, Alejandro Valverde’s career won’t last forever and the team needs to find suitable replacements. However, Izagirre is unlikely to become a grand tour contender – he has openly admitted that his strength is the one-week races – and Movistar have always been a team for the three-week races. Hence, their long-term goal may be to develop another grand tour leader to share the calendar with Quintana. Izagirre’s departure means that the team will find it much harder to cover the many one-week stage races in the WorldTour and they will miss a key domestique in the grand tours. Unfortunately, he is not the only major loss. Bahrain-Merida have been very active in picking riders from the Spanish team and one of their first actions was to sign a contract with Giovanni Visconti. The Italian may never have won as much as one could have expected but he has always been a very valuable rider for the team. He has played a key role for his captains in the grand tours and during his time with the team, he still won two Giro stages and a mountains jersey in the Italian grand tour in addition to a few smaller victories. He is suited to the classics and has been a valuable support rider for Valverde in the Ardennes so his absence will be felt. Javier Moreno will join him in the Bahrain-Merida team but it will be easier for Unzue to replace the Spaniard who has never been one of the key riders in the team. The team have done very little to replace the loss of their three climbers to Bahrain-Merida. In fact, they have only signed one real climbing domestique. Victor De La Parte has spent his entire career in smaller teams but he has always deserved to get his chance at the highest level. In the last two years, he has taken a major step, most notably with an overall win at the Tour of Austria and an 11th place at this year’s Tour de Suisse. Those results prove that he can play a solid rode for the captains in the mountains and this is the main reason for the team to finally give him the opportunity at the highest level. He is also a descent time triallist and so is a pretty complete stage race rider. His main objective will be to work for the team but he may get some personal opportunities in Spanish stage races like the Vuelta Asturias and the Vuelta a Castilla y Leon which often allows Movistar domestiques to shine. Interestingly, the team have waved goodbye to another two riders and it seems like there is a direct replacement for both of them. Francisco Ventoso was once known as a sprinter but in recent years, he has been a road captain who has taken care of the leaders in flat stages and taken his own chances in the cobbled classics. While he will be moving to BMC, Daniele Bennati has been brought in and he will play the exact same role. The Italian has proved to be one of the best road captains and a guarantee for grand tour leaders in flat stages and there is little doubt that he is a stronger rider than Ventoso. At the same time, the 2016 season showed that he can still win a few sprints and Unzue’s decision to sign the veteran is clearly the best he has made during the transfer season. Juan Jose Lobato won a few races during his time with the team but it was always evident that he was not suited to a squad made up of climbers. The Spaniard is one of the best in the world in uphill sprints but his poor positioning means that he is hugely reliant on team support. Movistar were never going to offer him much of that and so it was only natural for him to head for pastures new. Instead, the team have signed Carlos Barbero who is almost a copy of Lobato. None of them are fast enough to win real bunch sprints but they are among the best in uphill sprints. Barbero is not as fast as Lobato and so it will be difficult for him to win as much as his predecessor but as he is less reliant on support, he should be a lot more consistent. Finally, the team have continued their tradition of signing young talents. This year Richard Carapaz, Nuno Bica and Hector Carretero have been signed. Especially Carapaz who will be the first rider from Ecuador in a WorldTour team, stands out as an interesting addition. Known as a climber, he showed his potential at the Tre Valli Varesine where he rode very aggressively as a stagiaire. He clearly needs more time before he can achieve results at this level but he is a valuable addition for the future. Carretero has shown solid skills as a climber and time triallist. At the moment, he doesn’t stand out as one of the greatest U23 stage race talents but history shows that the best Spanish riders rarely achieve much at the U23 level. Finally, Bico is a late addition but he has not achieved the results that mark him out as a major acquisition. Together with Team Sky, Movistar is known as the best team for stage races and there is no doubt that the team is focused on the multi-day events, most notably the grand tours. However, with Alejandro Valverde who is probably the most talented rider for the hilly classics of his generation, the team are also among the most successful in the Ardennes. The triptych of races always plays a big role for the team and their veteran captain and this will be the case in 2017 too. As opposed to this, the cobbled classics play a subordinate role for Movistar. If they had not been obliged to ride the tough races in Northern Europe, they would probably have skipped this part of the calendar. They have never been competitive in these races and the team have never done much to try to improve in the events that suit them less. In 2016, however, Imanol Erviti suddenly got a big breakthrough in these races as long-distance breakaways and a tenacious performance when the favourites arrived from behind allowed him to finish in the top 10 in both Flanders and Roubaix. Of course the cobbles won’t play a big role for the team but there is no doubt that they will be keen to build on Erviti’s success. The first classics objective is likely to be Strade Bianche which is dear to Valverde’s heart. The Spaniard has already been close to victory in the past and he would love to win the first WorldTour edition of the race. The tough finale means that a victory is within his reach but it won’t be easy in a race that also suits the likes of Sagan and Van Avermaet down to the ground. Valverde is also likely to be the leader in Milan-Sanremo but he has never performed well in the Italian monument which has been suited to the faster riders in recent editions. The Spaniard needs to ride aggressively to achieve a result and they will miss Lobato as a back-up plan for the sprint. Jose Joaquin Rojas and Carlos Barbero can try to go for a top 10 in a sprint but none of them are fast enough to be on the podium. Their best card is Daniele Bennati who has a potential podium spot in his legs. In the cobbled races, the team will be led by Erviti, Jasha Sütterlin, Bennati and Andrey Amador. As said, Erviti was in the top 10 in both monuments in 2016 and he will again target Flanders and Roubaix. He is not explosive enough to mix it up with the best in the shorter races and follow the big accelerations so he has to focus on the long races where his huge engine comes in handy. His only chance is to anticipate the favourites like he did in 2016 and with a bit of luck, he can achieve similar results again. Sütterlin has had a slow start to his pro career but in the autumn of 2016, he showed clear signs of progress. Most notably, he was third in the Eneco Tour time trial and he rode impressively in the hard final stage that finished on the Muur. This shows that he is ready to take the next step in the classics. It is probably too early to target the monuments but he should be a lot more visible on the cobbles. Amador is mostly known for his Giro performances but he has always been in love with the cobbled classics. He has been close to the Gent-Wevelgem podium in the past and he will again try to achieve a result in these races. Of course he won’t win any of them but with a bit of luck, he has the engine to show himself somewhere. The team may also test Carlos Barbero in these races but he will need more experience before he can be competitive. However, their best option in the easier races on the cobbles is Daniele Bennati who returned to a higher level in the sprints in 2016. He should get some personal chances in the classics and is capable of top 5 finishes in races like Gent-Wevelgem. There will be a changing of guards for the Ardennes where Alejandro Valverde will arrive as the clear leader. In 2016, the classics played a less important role for the veteran who was doing his grand tour treble and had his eyes on the Olympics, but in 2017 they will again be his biggest goal in the spring. Until now, the Amstel Gold Race has always eluded him but he has made it clear that he aims to win new races next season. This will make the Dutch classic much more important than it has been in the past. The new finale makes it much more difficult for Valverde to win as faster riders like Michael Matthews, Bryan Coquard and Sonny Colbrelli can now be competitive. However, Valverde can definitely win in this finale too and it would be unwise to rule the veteran out. While the Amstel Gold Race has always been difficult for him, Valverde has dominated Fleche Wallonne in recent years and he will again be one of the big favourites for the mid-week classic. He will also be the man to beat in Liege-Bastogne-Liege even though he failed in 2016 when he suffered from the cold conditions. The addition of a cobbled climb in the finale suits him less as it favours the heavier riders but as he can be expected to be at 100% of his form in 2017, Valverde will still be hard to beat even if the new climb returns for the next edition. With Valverde in the team, there won’t be much room for anyone else. Daniel Moreno has had lots of success in these races in the past and even though he is no longer the rider he once was, he will be the back-up plan, especially in Fleche Wallonne. Carlos Babero may also be keen to test himself in the Amstel Gold Race which could be a future goal for him but at the moment, he is unlikely to be able to survive the tough finale. Valverde is likely to do the Vuelta and so the team will be less prominent in the autumn classics. The sprint races in Hamburg and Plouay don’t suit them but it could be a chance for Barbero to test himself in sprints at the WorldTour level. Valverde will be missed in Canada but the team could still have options to play. Especially Jesus Herrada is perfectly suited to the uphill sprints in both races and it is a matter of time before he gets his big breakthrough in that kind of races. He is usually in good form at that time of the year and if he skips the Vuelta, a win in these races is within reach. As said, Valverde wants to win new races in 2017 and this means that Il Lombardia will be a bigger goal than it has been in the past. The Italian classic is what is really missing from Valverde’s outstanding palmares but he has always missed the final bit of strength or luck to finish it off. He usually comes out strong from a grand tour and this means that he will again be one of the big favourites for the final monument of the year. Grand Tours are the bread and butter for Movistar and the three-week races will again be the biggest goal for the team. Traditionally, they have used the Giro as an opportunity for their younger riders while Nairo Quintana and Alejandro Valverde have been the leaders in the Tour and the Vuelta. Things were different in 2016 when Valverde targeted the Giro podium but as he returns to a more traditional schedule in 2017, the team will probably have their well-known approach to the three grand tours. At the moment, the team haven’t announced their plans for the three-week races and in theory Quintana hasn’t ruled out a Giro-Tour double, even going as far as cofirming his presence at the Giro on December 24. However, manager Eusebio Unzue quickly played that suggestion down and for us, it is very unlikely that the Colombian will ride in Italy. His big goal is still to win the Tour and until he has achieved that, it will be too much of a gamble to try a double which has become increasingly difficult in recent years. Furthermore, sponsor Telefonica is much more focused on La Grande Boucle and it is very unlikely that it will be possible to convince them that the Giro will be a good preparation race for the Colombian star. Valverde has already ruled out that he will return to the Italian race and so the Giro will be the only grand tour where Movistar won’t have a podium contender. They haven’t announced their plans yet and so it is anyone’s guess what kind of line-up they will have if Quintana skips the race. However, it seems to be guaranteed that Andrey Amador will return to a race where he has been in the top 10 in both 2015 and 2016. The Costa Rican has proved that he can be a GC contender in three-week races and the huge amount of time trialling means that the course suits him well. However, the level will be very high in the 100th edition and Amador is not climbing well enough to finish on the podium or repeat his fourth place from 2015. The goal must be to make it into the top 10 again. It will be interesting to see what schedule Ruben Fernandez will have. The Spaniard enjoyed a breakthrough performance at the Vuelta and he has the potential to be a grand tour leader in the future. It would be no surprise if Unzue tests his young talent over three weeks at the Giro. The amount of time trialling will make things difficult and we doubt that he has the consistency for a three-week race now. On the other hand, his talent is huge and he could deliver a surprise in Italy if he is given the chance. Another option could be to use Jesus Herrada in the Italian race. The Spaniard took a huge step in 2016 and he will be ready for more in 2017. He is probably not climbing well enough to be a contender in a grand tour but people said the same about Amador in 2015. In any case, he could be a formidable stage hunter for the Spanish team in Italy. Finally, Carlos Betancur is likely to ride. Nothing suggests that the Colombian will ever return to his former level but if he can, nothing is impossible for the huge talent. For the Tour de France, it will be all about the overall victory with Quintana. After his ill-fated 2016 campaign, he got a huge confidence boost when he beat Froome in a direct battle at the Vuelta. With barely any time trialling in 2017, he has a much better chance for success in France. On the other hand, the mountain stages are less hard and there is more climbing in the first two weeks where Froome is usually superior. The Brit will still be the clear favourite but with two second places already on his palmares, only victory will count for Quintana. The team will be selected to support Quintana fully and Valverde will again be the lieutenant. After he finally got that elusive podium spot in 2015, the Spaniard was much more relaxed in 2016 and he was completely loyal. Quintana can expect 100% commitment from his teammate but that doesn’t mean that Valverde won’t achieve something himself. History shows that he usually finishes in the top 10 even when he acts as plan B, and it is unlikely that he won’t be close to the best in 2017 too. At the same time, a high overall placing will give Movistar a much better chance to put Sky under pressure. The big problem for Movistar is that the rest of the team is far from being at Sky’s level. Daniel Moreno, Winner Anacona and maybe Ruben Fernandez will be the key domestiques in the mountains and even though they are all great climbers, they are not potential grand tour podium finishers like many of Froome’s support riders. That will make it even more complicated for the Spanish team to break Sky’s strangehold on the race. However, those three riders are all capable of winning a stage in the mountains and history shows that Movistar’s tactics often allow some of the domestiques to ride in breakaways in the toughest stages. Apart from that, there won’t be much room to chase personal success but Jonathan Castroviejo should be strong in both time trials as he continues to approach the top of the TT hierarchy. In the Vuelta, the team is likely to again line up with both Valverde and Quintana. Last year Quintana got the final confirmation that he can be competitive in two grand tours and so he will target a repeat win in Spain if he skips the Giro. However, it will be more difficult than it was in 2016. Back then, Froome had done the Olympics and was much more tired than he will be in 2017. 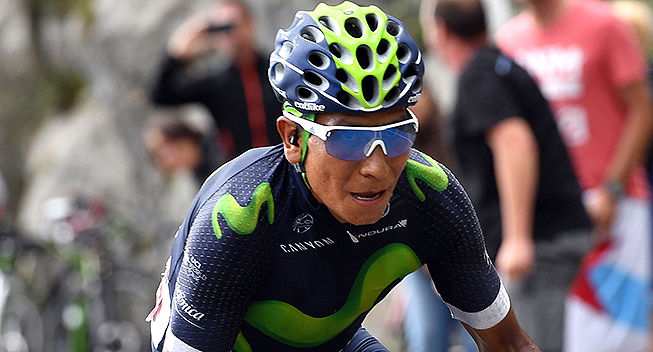 Nonetheless, it was only a surprise attack in the Formigal stage that allowed Quintana to win the race. Hence, the odds are against the Colombian but another win is definitely not out of reach. Valverde has traditionally been very strong in the Vuelta and history shows that he is always close to the podium. Even though Quintana will be the clear captain, he will probably have a bit more freedom in Spain and the team can realistically hope for two riders on the podium. At the same time, he will target stage wins in a race that usually has lots of stages suited to him. The rest of the team will be fully devoted to the leaders but a good time trial performance from Castroviejo or a stage win in the mountains for one of the climbers is a possibility. The composition of the team is still unclear but it is likely that Daniel Moreno will be the key lieutenant for Valverde and Quintana. As one of the biggest teams, Movistar usually focus heavily on the WorldTour races and the rest of their calendar is mostly focused on their home country where the domestiques usually get a chance to lead in some of the smaller races that have survived the tough economic climate. With their focus on grand tours and stage races, it is no surprise that they maybe have the best track record in the one-week stage races and this is their bread and butter in the first few months of the season until Alejandro Valverde turns his eyes to the classics in the Ardennes. In 2016, the team was arguably the best in the one-week stage races of the WorldTour even though Alejandro Valverde barely raced any as his late season schedule forced him to have a light spring. Nonetheless, they had Ion Izagirre in the top 5 at Paris-Nice, Tour de Romandie and Tour de Suisse while Nairo Quintana was in the top 2 in Vuelta al Pais Vasco, Volta a Catalunya and Tour de Romandie, taking wins in the latter two. In fact, the team only failed to have a rider in the top 5 in two one-week WorldTour races in the first half of the year, Tour Down Under and Criterium du Dauphiné. In 2017, the team will again be a powerhouse during the spring. Alejandro Valverde will probably get the season off to a winning start with his usual victory in Mallorca and he will also target another win in the Vuelta a Andalucia where he has been the dominant figure in recent years. With their focus on the WorldTour, Valverde could also head to the Abu Dhabi Tour to target the overall win. Movistar may even get their first win a bit earlier at the Tour Down Under. Without Juan Jose Lobato and Javier Moreno who have done well in the past, they may have a harder time this year. However, the race suits Jesus Herrada pretty well and he is traditionally strong in the early part of the season. The Spaniard took a huge step in 2017 and he will be a real podium candidate if he is again on form. When the big races kick off in Europe, the team will feel Izagirre’s departure. However, Valverde will again have a traditional schedule and this means that they will again have two leaders. It hasn’t been announced how they will share the workload but it has been hinted that Quintana will return to Tirreno-Adriatico. Valverde has often skipped both Paris-Nice and Tirreno but he could make another bid at the French race which usually suits him well. Alternatively, it could be a chance for Jesus Herrada and Ruben Fernandez to take leadership and they are both capable of a top 10 finish. Valverde and Quintana will probably share the two Spanish races in Pais Vasco and Catalunya between them and Quintana must be keen to go up against Froome in an attempt to defend his Romandie title. In any case, the team must target the victory whenever Valverde or Quintana are present and they should be obvious podium candidates in every WorldTour stage race. The spring also offers a few smaller stage races in Spain and they could be a chance for Marc Soler, Ruben Fernandez, Daniel Moreno, Winner Anacona, Jesus Herrada, Carlos Betancur and maybe new signing Victor De La Parte to ride for themselves in Asturias, Madrid and Castilla y Leon. These races usually also have a few bunch sprints where the level is not very high. Carlos Barbero is unlikely to win much outside of Spain but as he is now part of the best team in these races, he should take a few wins in Spain. In the autumn, the team will mainly have their eyes on the Vuelta and this should give a few chances to a wider range of riders. The Tour de Pologne and the Eneco Tour could be an opportunity for riders like Jesus Herrada, Gorka Izagirre, Andrey Amador, Nelson Oliveira or maybe even Jonathan Castroviejo as they are all good time triallists and the climbing is not too hard in those races. Castroviejo should continue his time trial progress and with his medal at Worlds, he is ready to take the next step by challenging for the victory in all the WorldTour time trials he does. There is a big chance that he will win one at some point. Furthermore, he will target the rainbow jersey as the final climb in Norway should give him a much better chance than he had in Doha. Oliveira is also getting better and better and should get closer to the top of the TT hierarchy. Finally, it will be interesting to see what level Adriano Malori can reach in his first season after his horrific crash. Many were surprised when Ruben Fernandez won the Tour de l’Avenir and as he failed to back it up in his first years at the pro level, it briefly seemed like the result was a fluke. However, he finally showed his full potential in 2016 as he finished in the top 10 in the Tour Down Under, Tour de Pologne and Vuelta a Burgos. However, his real breakthrough came when he dropped all the favourites to take the red jersey in the Vuelta and he seems to be ready to take another step. Unfortunately, there won’t be much room in a team with Quintana and Valverde and his TT skills are a handicap in many stage races. As said above, however, there should be some chances in select WorldTour stage races and some of the smaller races in Spain where he can really prove himself as a climber. Another Tour de l’Avenir winner in the team is Marc Soler. He hasn’t shown much as a pro but he delivered a magnificent performance in the Route du Sud queen stage where Quintana gave him the chance to go for the win. Of course the level in that race was not very high and he hasn’t backed his performance up. However, it seems that he has the potential and like Fernandez, he should flourish at some point. The question is whether it will already happen in 2017. Jesus Herrada is already going into his seventh year in the team and so he is no longer an inexperienced youngster. However, it has taken some time for him to show what he can do but now he is finally starting to deliver on his promises. In 2016, he took a marvelous stage win with his great punch in an uphill finish at the Criterium du Dauphiné and this came on the back on some solid TT and climbing performances at the start of the year. He is probably never going to be a great climber but he is improving his TT skills. If he can get a bit better at defending himself in the mountains, he should be a solid stage race rider in the future. However, his puncheur skills are his biggest assets and in some of the hilly one-day races and stage races, he could take over from Valverde who can’t do every race on the calendar. If he can add a few percent to what he showed at the Dauphiné, he will be scary in these finales.